Ajuga (also known as Bugleweed) is a perennial landscape plant that has a tight mounding habit of about 6 to 8 inches tall. Ajuga are commonly used as ground covers due to their quick growth and ability to add color to a large area. They are also great in combination planting. The Ajuga that we carry are all very cold-hardy. To achieve the best results with Ajuga, use a well-drained soil in partial shade with light feed (150 ppm nitrogen). Plant 1 plug per 4in pot. Watch for aphids and spider mites. Root rot diseases can also be a problem. Once established, Ajuga are very easy to care for. In a landscape environment Ajuga require little more than rain water to do well. Ajuga are not known for their flowers. Chocolate Chip is a spreading plant and will probably not require pinching. A light pinch might become necessary to shape the plant for your final needs. Ajuga can be grown pot tight in 1801s or 4 inch pots. 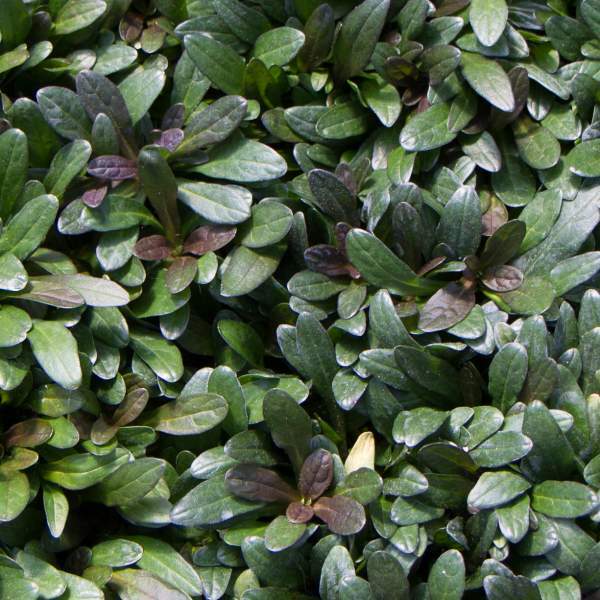 While Ajuga are responsive to plant growth regulators, you usually do not need them because the plants are not prone to stretch and get tall. Whiteflies and possibly aphids are the biggest pest problems with Ajuga. Chocolate Chip are not prone to many diseases, but watch for botrytis while the days are short. This grey rot is usually associated with wet or humid conditions. You can prevent botrytis by allowing the plant to dry out between waterings, allowing for good airflow in your greenhouse, and spacing to allow the sun to penetrate to the soil level. The most common chemicals used to treat botrytis are Medallion and Banrot. Use them as a drench according to each label’s instructions.